Here are the steps to capture a file from the ACBL scoring program, and later, how to upload the file to the web server. 1. While within the ACBL scoring program, ACBLscore, use the LR command to create a recap of the game. Type in LR and press the ENTER key. 2. Now select option 3, Text file. 3. Now type the location of where you want to save your game result file. Here, I am saving it to an external flash drive by typing in F:\ in the file location field. 4. Now select the recap option that you prefer. Option 5 gives a familar recap sheet, while option 10 gives an interesting travelor-style format. In this example, I have selected option 5. (Advanced users: It is possible to combine both options, if you are interested I can tell you how). 6. Select "By rank" to order the players in order of finish. 7. The result file should be now be stored on your external media. (e.g. F:\090620.txt) Once you have access to the Internet (and this web site) you are now ready to upload the file. Make sure you have inserted your thumb drive (or other external media) into your home computer. 8.If you have an administrator role assigned to you, log onto the website furnishing your User ID and Password on the home page. After logging on, select your club from the dropdown on the home page. Then, click the Results link located at the top of the screen. 9.On the Results Page, click the Add Result link located on the left side of the screen. 10. On the Add Result form, click the Browse button to navigate to the result file that you saved. 11. 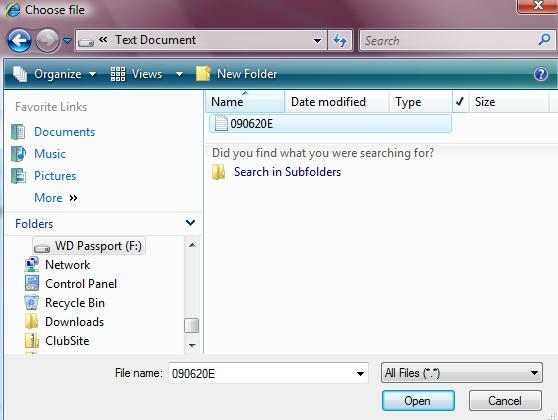 In the Choose file dialog window, navigate to the result file that you had saved on the external drive. Here, I had saved the 090620E.txt on my F:\ drive. Select your file and click the Open button.